BARATZA DOES EUROPE - Marco Beverage Systems Ltd. In the first of a couple of pre Caffe Culture/WBC 2010 posts, I am delighted to say Marco will exclusively launch the Baratza range of Coffee Grinders in Europe for the first time at Caffe Culture. The perfect partner, Baratza are as passionate about innovation and cup quality as Marco. 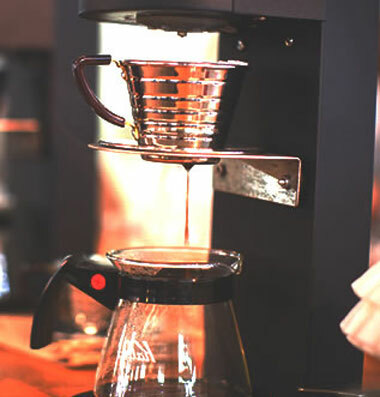 Baratza supply a range of grinders for the domestic/professional marketplace, with coffee quality and user experience as fundamental cornerstones. I met with Kyle Anderson, co-founder of Baratza for the first time in Host, Milan last October. It was petty obvious our companies had synergies worth exploiting. Much research, many samples and evaluations later, we launch the range exclusively in UK for the first time at Caffe Culture Booth E105. I am pretty chuffed to offer our customers the exciting Baratza product range, which is timed to meet the market’s needs for small volume hand-brewing in commercial applications and high quality grinding options for the home-barista. Baratza has been the grinder of choice for the US speciality community for quite some time. With stock landing on our shores on June 20th, the range, Maestro, Maestro Plus and Virtuoso will be available from Coffee Angel, Hasbean and Square Mile from July 1st, with other distributors/outlets to follow. A few related links –Dave Walsh’s Baratza review; Mike Philips tips on choosing a home grinder and Coffeegeek’s openforum reviews of Maestro, Maestro Plus and Virtuoso.